In today’s fiercely competitive marketplace, formalizing a quality assurance program is imperative for every organization looking to meet customer requirements and avoid the steep cost of quality failure. As defined by the International Organization for Standardization (ISO) 9000, quality is the degree to which a set of inherent characteristics fulfills requirements. ISO 9000 was created by the ISO as a way to define, establish, and maintain an effective quality assurance system for manufacturing and service industries. As you establish internal processes to fulfill your unique mission and objectives, quality standards will be individually tailored, but understanding the Three Lines of Defense Model and the potential cost of a failure is a great place to get started on quality assurance. Front line staff and operational management. The systems, internal controls, the control environment, and culture developed and implemented by these business units are crucial in anticipating and managing operational risks, including quality issues. Risk management and compliance functions. These functions provide the oversight, tools, systems, and advice necessary to support the first line in identifying, managing and monitoring risks, including quality. Internal audit function. This function provides a level of independent assurance that the risk management and internal control framework is working as designed. The third line of defense helps most companies detect quality issues across their critical internal processes. 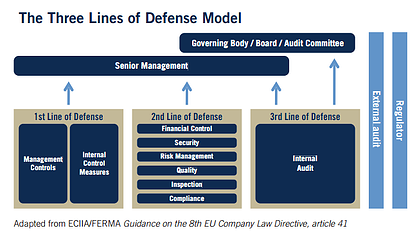 Based on the lines of defense methodology, quality issues should be prevented and assessed across the company at the second line of defense as identified below, reducing some of the burden on the third line of defense for identifying and resolving issues. By implementing quality in conjunction with the lines of defense described above, organizations can reap many benefits across the enterprise. Quality can assist in the assessment of staff’s skills against current responsibilities to identify learning opportunities, for example. It is also able to identify opportunities to modify existing processes to enhance effectiveness, efficiency, and consistency. Additional benefits include strengthened competitive outlook, increased customer loyalty, and higher productivity, to name a few. Quality failure is costly, and the time to recover can be significant, if recovery is even possible. The cost of quality failure can be categorized as internal or external. Internal failure costs are those caused by products or services that do not fulfill requirements established prior to delivery, while external failure costs occur following the delivery of products and services to external customers, which lead to customer dissatisfaction. Wells Fargo recently exemplified a quality failure in its sales practices when employees opened as many as two million deposit and credit card accounts for people who either did not exist or did exist but did not have any knowledge of the accounts. The bank failed to follow its own official policy, “Sales Quality Manual”, which stated that customer consent for each specific solution or service is required every time. The cost of failure to Wells Fargo was a fine of $185 million for what regulators called “widespread and illegal” sales practices and the resignation of their CEO, John Stumpf. Additional non-financial consequences such as reputational damage and decreased productivity also impacted Wells Fargo. Implementing quality is important to organizations looking to effectively achieve its mission and objectives all while enhancing productivity and output. 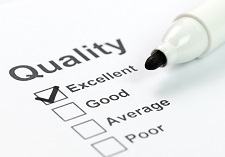 Quality assurance will reduce the impact of failures while helping your company stand out amongst your competitors. Compare your organization to the Three Lines of Defense Model, and you’ll be well on your way to an effective start to your quality assurance program.